You want to bring key actions on screen, so they are in sight. You don't want to hide them under the menu-button. 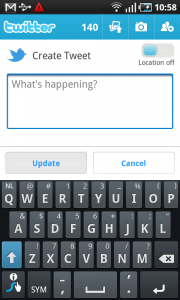 The action bar is best used for common actions like search, refresh and compose. When screen real estate is valuable, consider putting actions in the options menu. 1 In the Twitter app, the Twitter logo is always in the action bar on the left. From every page it directs back to home, the page shown above. 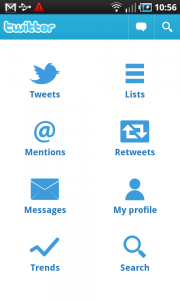 Two functions are placed here on the right: create tweet and search. 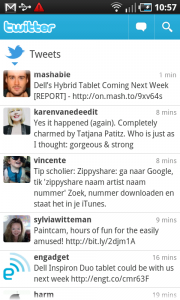 2 The action bar on the Tweets-page has an extra function: refresh. 3 On the create tweet-page the actions as mentioned before can no longer be applied. Here the user can take different actions: upload an image, make a picture, and add user name. 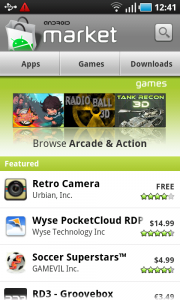 1 The action bar in Android Market is always the same, except for the title of the directory the user finds himself in. 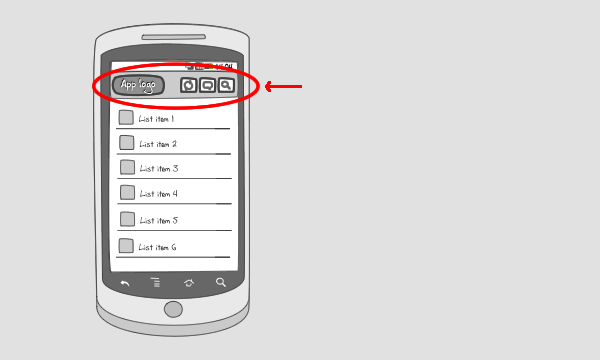 On the left there is the logo, which leads the user back to the app home. And the user can search the market using the button on the right. 2 Logo on the left, search button on the right. Could you post sample code to demonstrate the patterns suggested here. I recommend to use the ActionBarSherlock it is really easy to use and understand with the samples.